Each year, the International Quilt Association hosts a Celebrity Mini Quilt Silent Auction at International Quilt Festival in Houston. IQA award winners, IQA quiltmaking friends, and Festival teachers are invited to submit a small quilt for auction, with the proceeds going to support the activities of the International Quilt Association. 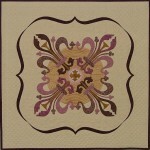 This year, I have entered my new quilt For Such a Time as This into the IQA juried show in Houston. I haven’t posted a photo of the completed quilt yet, but I have been sharing its progress in previous blog posts. 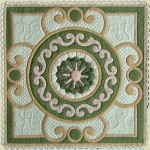 If you have been following along, you will know that the theme of this quilt is time and that the center medallion is divided in twelve – just like the twelve hours on a clock and the twelve months of the year. 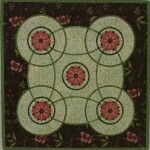 The silent auction quilt is a 22-inch circle, also divided in twelve. 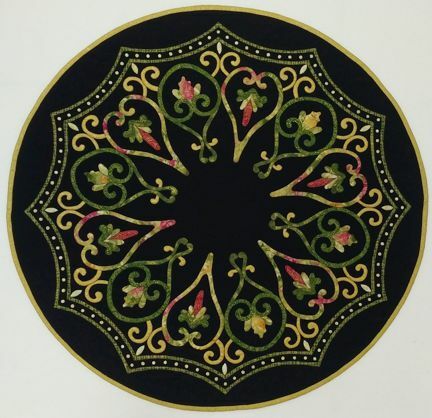 The interior motifs were prepared using the Apliquick method and machine appliquéd; the tiny 4 mm circles were prepared using the Apliquick method and hand appliquéd (for obvious reasons); and the outer round and scalloped frames were needle-turn appliquéd. I called the quilt Finding Time. I often say that we don’t find time, we make time. So while I made it, you can find it in the Silent Auction at International Quilt Festival in Houston, November 2-5, 2017. Maybe I’ll see you there! Good question, Deanna. I think you can only bid in person at the Quilt Festival but if I hear anything different, I will let you know! Ok, I’d really like to have this quilt! Can you bid online? Thanks for the great presentation at the PEC guild last week. 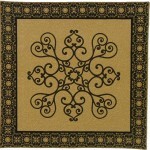 It was a pleasure to hear all about appliqué, done with gusto.